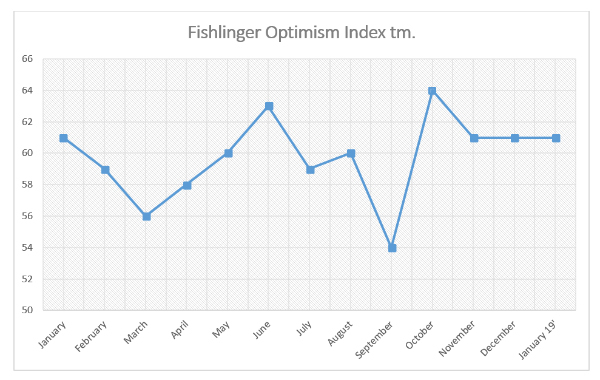 The Fishlinger Optimism Index™, a breakthrough measurement of public opinion centered on Americans’ optimism about the future from the Fishlinger Center for Public Policy Research at the College of Mount Saint Vincent, stayed at 61 in January 2019, the same as in November and December 2018. During this period, only personal prosperity increased probably a function of improved stock market performance. 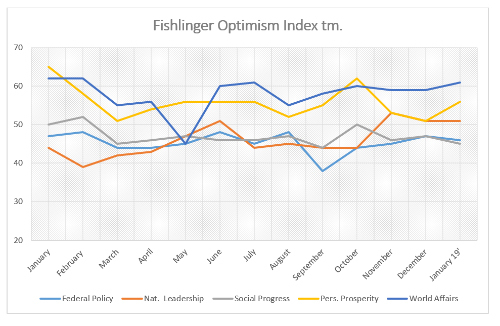 In measuring national leadership, the Fishlinger Optimism Index™ assesses public expectations for the effectiveness of federal policy and quality of governance both domestically and in global affairs. Social progress examines the potential for progressive reform. Personal prosperity explores individuals’ sense of achievement and economic stability.